Patent Law Injunctions is a comparative work on injunctive relief in patent law in major jurisdictions around the world. It contains an extensive analysis of the United States, the European Union (EU), selected EU Member States (Germany, France, the Netherlands, Belgium, the United Kingdom and Poland), China, India, Japan and South Korea. It covers both preliminary (interim) and permanent injunctions. In numerous jurisdictions, courts have realized that injunctive relief should not be available automatically in case of patent infringement. Particularly in the wake of the US Supreme Court decision in eBay v. MercExchange, it has become clear that granting an injunction may in some cases enable abuse by patent holders in order to obtain royalties exceeding significantly the value of the patent-protected invention or that it may be manifestly against the public interest. advantages and disadvantages of various approaches to injunctive relief. A proposal for an optimal model of granting injunctions is also included. Given that there is a growing consensus as to the circumstances in which injunctions should be available to the patentees and the circumstances when injunctions should be denied, a comprehensive analysis of the various legal doctrines that justify a more flexible approach towards injunctive relief is warranted. 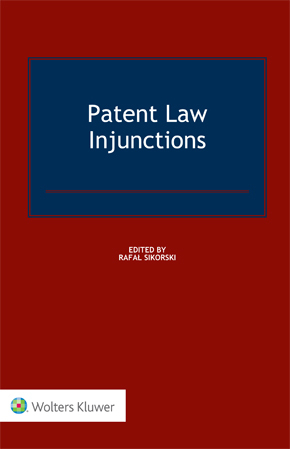 This book will give patent law practitioners and in-house counsel the opportunity to draw from the experience of other jurisdictions where courts faced similar problems. Policymakers, patent office officials, academics and researchers in intellectual property law will also welcome this approach.